A graduation may be by itself just a simple ceremony; however it comes at the end of years of hard work and sacrifice. For someone who have reached graduation, it means success, the beginning a new chapter in life, and to some extent it can even mean freedom. There is no understating the importance a graduation ceremony. The sad fact is that not all who have been with that person through thick and thin may be able to attend that graduation. Prior commitments, time constraints, location and seating within the venue are just a few reasons loved ones can’t attend a ceremony. However, there is a way to make sure they still get to see the memorable event as it happens; live streaming. Money saved for the audience far away – Attending a graduation in another part of the country, or another country altogether, will cost money, sometimes too much. There’s airfare to consider, accommodation, meals, etc. Sharing of videos – Graduations live streamed through social media platforms are easily shared. Even if you choose to live stream to your website, sharing links on social media is really accessible and makes sharing those moments even easier. Online audiences can form their own supportive community through their comments, likes, shares, tweets etc. No interruptions – When you live stream graduation, it is broadcast in a similar way to news coverage. The event can be paused live, rewound and played back later. This is ideal if you’d like to replay that proud moment. No captured audience – Let’s be fair, you’re watching for the one or two family members or friends who are graduating. The graduation audience will sit through all the graduates names being announced whilst those online can continue their day once they’ve seen what they’d like to see. Available for playback later on – It gets even better! After the live stream, the video is available on immediate playback. You can play back anytime, from any device, as long as there is an Internet connection. And yes, you can skip any boring parts to get to the section that is really important you. For many, graduation is a once-in-lifetime event. The good news is that you can experience it again and again via video. Live stream that graduation and have your own copy, keep those memories fresh and available whenever you want them to be. We have good credentials when it comes to covering graduations. 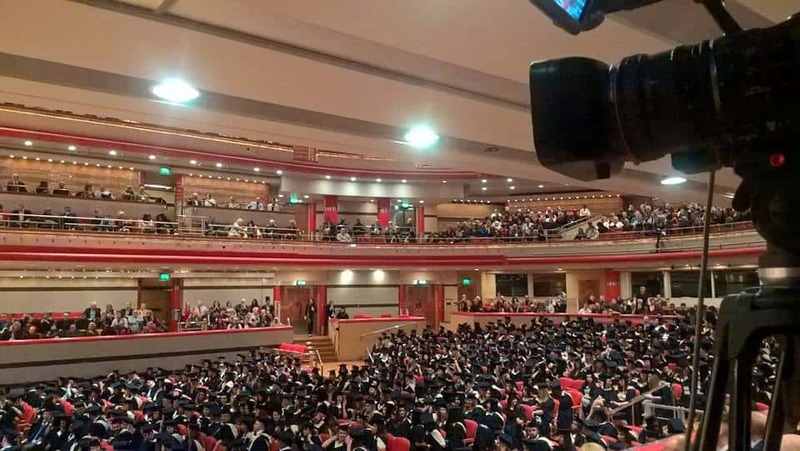 We currently live stream graduations for a local University as well as other events they host throughout the year.